Bead weaving can be done with or without a loom. The technique involves many warp threads and usually a double weft. The word chatelaine comes from the French chateau or castle, and laine or wool, and refers to someone who held keys to the linen cupboard in a castle. 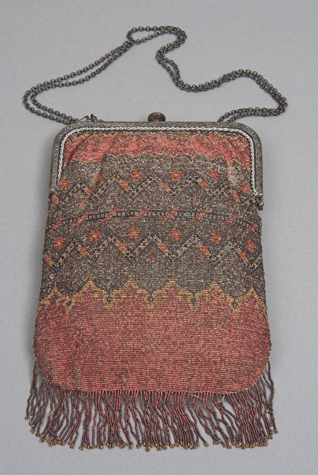 The word then became attached to any purse used to carry keys, and then to all small beaded purses like this one.